Chu Wenhao and his teammates from a rural primary school couldn't stop themselves from shedding tears after they recently failed to win a two-day soccer tournament. Though the 11-year-old's team, from Chashui Primary School in the mountainous county of Qianshan, Anhui province, secured third place in the tournament that ended on Oct 1, the children had expected a better result. 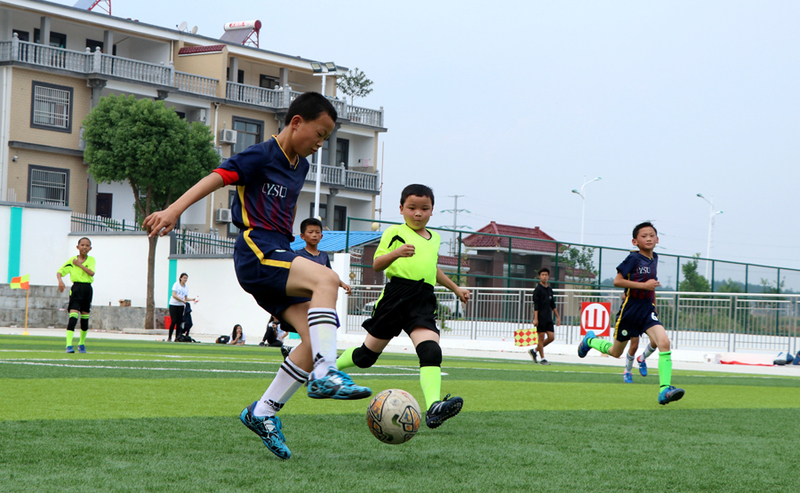 Nine primary schools in Qianshan have formed student soccer teams with the help of the Youth Spotlight, a campus community from the Shanghai American School. As the last school to join the program, Chashui Primary didn't even have a team until early September, when the semester started. "One of the nine eligible schools didn't participate in the competition because, although the boys wanted to win, they didn't have confidence in their abilities," said Huang Yujia, a 17-year-old at Shanghai American School, who founded Youth Spotlight. Most of the 225 members of school soccer teams in Qianshan are "left-behind children", whose parents have migrated to cities in search of work. That means the children are left in the care of their grandparents and other relatives, according to Huang, who was in the county with more than 20 Youth Spotlight members to help organize the tournament. The teams are primarily for left-behind children, but the organization is wary of labeling them as such for fear of discrimination, and anyway, all local students are welcome to join in, according to Huang. Chu has been living with his grandparents for more than five years, since his parents left to run a snack stall in Hangzhou, capital of Zhejiang province. His 18-year-old brother joined them two years ago. Though he's open and active with his teammates, Chu is still reserved in the presence of teachers or strangers. However, in the past month, he has been experiencing happy times thanks to the cooperation between his school and Youth Spotlight, according to Chu Guoqiang, his 72-year-old grandfather. Huang, whose father grew up in an impoverished rural family, first heard about left-behind children in 2015. "I cried when I saw media reports about how four left-behind siblings in Guizhou province had committed suicide by drinking pesticide," she said. "I'd never heard of left-behind kids before then." At the beginning of last year, after researching the issue by reading reports and talking to some left-behind children who were visiting Shanghai, Huang decided to provide help by founding Youth Spotlight. The project quickly attracted the participation of many of her schoolmates, mostly international students whose parents work in China. "More than 70 of my schoolmates have joined in, with nearly half of them very active in organizing activities for the kids," she said, adding that many of the left-behind children she has met are bored with their rural existence. Initially, Huang wanted to help children in Guizhou, where the four children committed suicide, but she realized that the province was too far from Shanghai. "The distance would make it too difficult and costly to provide regular, meaningful help," she said. After more research, she discovered that Anhui, which has a registered population of more than 70 million, is home to a large number of left-behind children. Early last year, Huang began looking for schools in rural Anhui that would be willing to cooperate with the project, and contacted dozens she found online. "Most of the people who picked up the phone rejected my suggestion. They asked how I had found their numbers, and they were afraid and unsure of my motivation," she said. Things only improved when Tianzhushan Primary School in Qianshan agreed to allow her to visit. When she arrived in March last year, Huang met the principal and explained that she wanted to help the children by offering them the opportunity to engage in an activity they loved. "However, I didn't decide the activity－the children did. After we asked eight classes of fourth and fifth graders, the answer was clear; the thing they most wanted to do was play soccer," she said. "Their wide agreement excited me. What could be better for left-behind kids than bringing them a sport that fosters camaraderie and cooperation?" In November last year, the first team in the county was founded at Tianzhushan Primary. Seven more schools joined the project this year. Huang and her schoolmates tried a number of ways to raise funds, with the most effective methods being canvassing donations online or approaching individual sponsors. "We tried raising funds from businesses, but they rejected us because they didn't think it would benefit them," she said. After two rounds competing for funds against other student clubs at Huang's school, Youth Spotlight received a grant of $3,500, along with a number of donations from individuals. The organization used the money to give every team soccer jerseys, with the name of the school printed on the back, and provide subsidies to teachers who coach the children part time. Huang has visited Qianshan five times, and has also spent a month in Boluo, a village administered by Chashui, to see how the children live. She is planning to publish a book she has written, based on the children's experiences, and has also published diary entries written by left-behind children in Guizhou, which she translated into English. The teachers in Qianshan send her photos of daily training sessions. "That way, I can make sure the children enjoy real engagement in soccer," she said. The children's parents also provide support. Chu Wenhao, now in the fifth grade, recently received a soccer ball worth 90 yuan and a pair of sports shoes from his father. "The boy's parents are happy to know that soccer makes him happier and stronger," his grandfather said. The family hails from Laowu, or "old house," a village in Chashui. After years of hard work in Hangzhou, Chu Wenhao's parents have managed to build a two-story house in the village. Some family members have already moved in. "The new house was built for my older grandson, who will need it when he marries," Chu Guoqiang said. Chu Wenhao's father, Lu Jiayou, comes from a poorer family than his wife, so he lived with his parents-in-law and his sons have taken their name, not his. The boy's grandparents farm about 0.5 hectare of land, just enough to feed themselves, but even with his grandparents the boy is withdrawn. "He just spends a lot of time playing soccer at home after school," his grandfather said. Wang Zhongwu, a math teacher who is also a part-time soccer coach at Chashui Primary, said Chu Wenhao has become more open and his confidence has grown along with his soccer skill. Under Wang Zhongwu's guidance, the boy and his teammates play soccer before and after class. He recalled that when the teachers brought the students to the county seat in their cars, the boys were excited because they hardly have any opportunities to travel. Wang Rui, the principal of Chashui Primary, said Chu Wenhao is just one of 500 students at the school－who are mostly left-behind children－and hundreds more across the county who need help. Huang, the student in Shanghai, said some local schools are willing to use their own money to support the soccer project, but a lack of funds is preventing Youth Spotlight from expanding its efforts to help deprived children. She recently applied to register the organization as an NGO, and is waiting to hear if the application has been successful. "Next year, I will probably go to the United States to study, but Youth Spotlight will continue to try and help deprived, rural children," she said. Huang Yujia, a student at the Shanghai American School who founded Youth Spotlight. In 2015, I was watching TV at dinner time, when I saw a news story about four siblings－"left behind children"－in Guizhou province who had committed suicide. I was shocked. A note written by one of the children was found at the scene: "I know you care about me, but it's time for me to go. Death has been my dream for many years." What kind of lives must those kids have been living for them to kill themselves? Being a privileged girl growing in a teeming metropolis with my parents, I had never even heard the term "left-behind children" before. Eager to find out more about such children, I searched for all the news articles and books I could find on the issue. After reading lots of books and research papers as well as briefly interviewing 20 left-behind children over a span of almost a year, I was surprised that I was still at a loss when someone asked me to tell them about left-behind children. I knew they were lonely, I knew they missed their parents, but I did not truly understand their struggles and thoughts. I only knew that I was fortunate to enjoy luxuries such as salmon and ribs because my father made sacrifices to ensure I didn't experience the poverty he did when he was growing up. Somewhere in the bottom of my heart, I knew that it was time for me to lend a hand to China's future generation, just like my parents did for me. After talking to left-behind children about their passions and also speaking with their teachers, I decided that Youth Spotlight would be a movement to bring warmth to left-behind children and make up for the childhoods they have lost. Lonely and deprived of regular communication with their parents, many of them are bored and shy. Youth Spotlight is about changing that through soccer, a sport that's rapidly growing in popularity in China. I recruited six students and began planning the first Youth Spotlight soccer team. From fundraising online to designing soccer kits, we engaged with work that brought us joy. Finally, in November 2016, the first Youth Spotlight soccer team was formed in Qianshan, Anhui province. Months of fundraising and planning turned my hopes into an unprecedented opportunity for the students at Tianzhushan Primary School. By this summer, we had been joined by dozens of students who are passionate about social justice. After two rounds of fierce competition with other clubs at my school, Youth Spotlight received a grant of $3,500 from the Shanghai American School community. With the funds and growing financial support from individual sponsors, we were able to form nine soccer teams in schools in Qianshan. In October, I applied for NGO status for Youth Spotlight. As an officially recognized NGO it will be easier for us to expand and benefit more children. No matter how big our organization becomes, I will always stay true to Youth Spotlight's mission to empower left-behind children through soccer. A high school student from Shanghai is bringing happiness to deprived youngsters in rural areas.